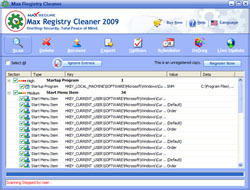 Max Registry Cleaner provides solution to Windows registry related problems. It scans the Windows registry and finds incorrect or obsolete information in the registry. You can safely clean, repair and optimize the Windows registry by fixing this obsolete information in Windows registry. By using a Max Registry Cleaner regularly and fixing registry errors your system will run faster, will be more stable and error free. Using defragmentation option, provided in Max Registry Cleaner eliminates registry fragmentation thereby giving you a fresh new registry with no redolent or obsolete data. This defragmentation of registry speed up your system, which improves System Response Time and ensures better user access time. Max Registry Cleaner scans your entire registry for any invalid entries and provides a list of the registry errors found on your computer. You can clean each item or automatically repair them all. Max Registry Cleaner can also take a backup of any repairs made so that you can easily recover any changes if required.